Ormsby McKnight Mitchel was an attorney, educator, astronomer and Union army military leader in the American Civil War. Mitchel was born on August 28, 1810, near Morganfield, Kentucky. His father died when Mitchel was three years old. In 1814, Mitchel's mother took her family to Ohio. The family first lived in Miami and then settled in Lebanon, Ohio. As one of the younger children in the family, Mitchel attended school. At the age of twelve, Mitchel left school and took a job as a clerk for a storeowner in Lebanon. Mitchel still loved learning, and he spent the next several years educating himself. In 1825, John McLean, Postmaster General of the United States and a resident of Lebanon, helped Mitchel secure an appointment to the United States Military Academy at West Point. Mitchel graduated in 1829. He ranked fifteenth in his class. After Mitchel's graduation, the United States Army assigned him to teach mathematics at West Point. In 1831, he was reassigned to Florida and served as a second lieutenant of artillery. Unhappy with military life, Mitchel resigned his commission and opened a law practice in 1833 in Cincinnati, Ohio. Less than a year after becoming an attorney, Mitchel returned to teaching. In 1834, he accepted a position at Cincinnati College as a professor of mathematics, natural philosophy, and astronomy. In this position, Mitchel played a leading role in establishing an observatory for the college. He convinced prominent Cincinnatian Nicholas Longworth to donate land for the project and recruited investors to assist in the construction of the building. Completed in 1845, the observatory was one of the most advanced in the United States at that time. Following the observatory's completion, Mitchel resigned his professorship, but he continued to serve as the chief operating officer of the observatory. He began to give lectures on astronomy across the United States and became recognized as one of America's best known astronomers. To supplement his income, Mitchel also served as a construction engineer for the Ohio and Mississippi Railroad. He had served in a similar position for the Little Miami Railroad during 1836 and 1837. In the late 1840s, Mitchel resigned his position with the Ohio and Mississippi Railroad. Company executives accused him of fiscal mismanagement. Mitchel spent the next decade lecturing on and studying astronomy. When the American Civil War began in 1861, Mitchel worked to assist the Union. He gave several speeches in Cincinnati, encouraging men to enlist. 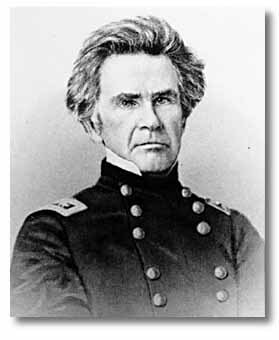 He also briefly commanded the Department of Ohio and helped plan Ohio's defense against invasion. On August 8, 1861, Mitchel received a commission as a brigadier general of Ohio volunteers. He played an important role in training the unskilled men. Mitchel participated in the Fort Donelson campaign in February 1862. He also assisted in the capture of Nashville, Tennessee, by the Union on February 23, 1862. The mayor of Nashville surrendered the city to Mitchel. Upon securing Nashville, Mitchel advanced on Huntsville, Alabama. His goal was to destroy railroad tracks built from east to west across the Confederacy. Mitchel had limited success. He only had fifteen thousand troops under his command, and Confederate guerrillas successfully attacked his men. While most white Confederates were unhappy with the presence of Union soldiers among them, many of these people came to respect Mitchel for his kindness. He ordered his men not to steal from the civilians. Mitchel did grant some slaves freedom but only if the African Americans provided his men with information. Other slaves who ran away to Union lines were returned to their owners. In July 1862, Mitchel was promoted to major general. At the same time, the Secretary of War removed Mitchel from his command. Mitchel was known for his difficulty in working with officers of the same or higher rank as himself. He especially came into conflict with General Don Carlos Buell. In July 1862, Mitchel was seriously debating whether or not to resign his commission because of his differences of opinion with Buell. Rather than allow a competent officer to resign, the Secretary of War transferred Mitchel to Washington, DC, and then reassigned him to South Carolina. Mitchel contracted yellow fever shortly after arriving in South Carolina and died on October 30, 1862. Mitchel, Frederick Augustus. Ormsby Macknight Mitchel, Astronomer and General: A Biographical Narrative. Boston, MA: Houghton, Mifflin, and Company, 1887.